The Point Manager is a RF receiver with an integrated data Web Manager. It receives CRC-16 error-checked data packets from Point Six’s sensors, processes the data, and makes the data available to be queried by simple ASCII commands or through dynamic HTML. The dynamic HTML can be viewed with any standard browser. The Point Manager communicates with a PC using TCP/IP or serial protocol. Simple ASCII commands are sent over the Ethernet using TCP/IP and/or RS232 serial port. The Point Manager contains a time of day clock, battery backed RAM, and flash programmable memory. It is fully configurable, both locally and remotely. It can store configuration information for up to 100 sensors having a combined maximum of 250 I/O points. The Point Manager was built with the flexibility needed to satisfy varied user requirements. There are several modes of operation that allow the user to balance simplicity, costs, precision, and timeliness. Monitoring - The easiest way to get information from the Point Manager is to view the current sensor values. This can be accomplished with a Web browser (no software coding required) or polling by a host. Both alarms and data are available. The dynamic HTML page displays on each row the following sensor information: name, serial number, age since last reception, service mode indicator, readings and units. All readings are shown in engineering units. Collecting – Snapshots of the current sensor values can be periodically stored in a Historical Log. The snapshots can be retrieved for later analysis. All configured sensors readings are used in the snapshot. The snaps can be taken from once a minute to once every 7 days. The Point Manager can be thought of as a remote data logger. Concentrating – Key changes in a sensor reading, sensor age or system parameters can trigger records to be logged into an Event Log. The following items can be configured to trigger events: Point Manager startup, Historical Log % full, sensor age, sensor service button, analog I/O high/low thresholds, counter I/O base count and interval, and state change. The Point Manager stores a time stamp with the event. Approximately 1800 events can be stored in the Event Log. Also when an event is triggered, the Point Manager can optionally take a snapshot of the current sensor readings and store it in the Historical Log. Notifying – Each event can be configured to trigger the Point Manager to notify a host. The Point Manager can notify a host either pushing a connection through the Ethernet (TCP/IP) or serial port. The host computer then does not need to be always connected and polling the Point Manager. The Point Manager can inform the host of the exceptions by establishing the connection. The Point Manager can be configured to notify up to 5 host destinations trying each destination until the event is confirmed delivered. The Point Manager can also send alarms via SMTP email through the Ethernet. 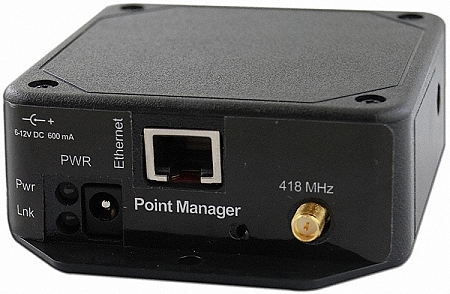 The Point Manager is a data logger that can be used to store data while the Point Manager is not connected to a host computer. The data-logging feature can be used as a backup in case communications is lost through the Ethernet or serial connection. The Historical Log and the Event Log are circular. If either becomes full, the next record will overwrite the oldest record. CRC16 error checks are added to the simple ASCII commands and response when using the local serial port. As an option, the Point Manager can initiate a connection to a host web server at regular intervals or when an alarm occurs and can deliver (via HTTP Post) XML files. The XML files contain History and/or Event records. The XML files can then be easily posted to a database. This mechanism makes it possible to install the Point Manager behind a firewall without changing the setup of the firewall. The Point Manager can be easily configurable using ASCII commands. Each sensor can be given a label name and setup information for each I/O point such as engineering scale and offset, units label, and alarm trigger information. The Point Manager has a “media callout table” where the user can specify which host destinations the Point Manager is going to connect for notification by either serial or Ethernet. The Point Manager can also be configured to callout periodically with interval times from once a minute to once every 7 days. The Point Manager has optional security through two levels of login passwords: one for access to data and setup information and the other for changing the setup information.